The dangerous machineel tree is thriving in Turks & Caicos. The manchineel tree has many toxic qualities. A full-grown manchineel tree, in a favorable environment, may reach at maturity about 65 feet (20 meters) in height and with a 3-foot diameter at the base, although it rarely reaches these dimensions in TCI. The tree has shiny green, oval leaves, with glands on the petioles. It has smooth, greyish bark and small, greenish-yellow flowers. The leaves are simple, alternate, very finely serrated or toothed, and 5–10 centimeters (2–4 inches) long. Spikes of small greenish flowers are followed by fruit, which are similar in appearance to a crabapple and are greenish-yellow when ripe. The small fruit measures about 1 to 2 inches in diameter and is deceptively sweet in flavor, but do not eat it! All parts of the tree contain strong toxins, some of which remain unidentified. The leaves of the tree contain 12-deoxy-5-hydroxyphorbol-6-gamma-7-alpha-oxide, hippomanins, mancinellin, and sapogenin, phloracetophenone-2,4-dimethylether, while the fruits possess physostigmine. The milky white sap of this tree is incredibly caustic and poisonous. It contains phorbol and other skin irritants, producing strong allergic dermatitis and caustic burning. 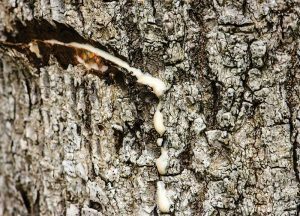 A single drop of sap can cause skin blisters, dermatitis, swelling and/or burns. It is so caustic it has been reported to cause damage to the paint on cars. The manchineel’s milky sap is very harmful. Using the tree as shelter when it rains can be particularly detrimental. A person who does this can experience burns and blistering on every portion of skin exposed to dripped rainwater. The sap is so caustic that the raindrops, passing through the branches of the manchineel tree, pick up enough toxins to cause burns. The bark is poisonous too—burning it releases a smoke that can cause temporary (and in some cases, permanent) blindness if smoke reaches the eyes. Eye contact with the milky sap (latex) produces bullous dermatitis, acute keratoconjunctivitis and possibly large corneal epithelial defects. The fruit is fatal if ingested, as it causes severe gastroenteritis with bleeding, shock, bacterial superinfection, and the potential for airway compromise due to edema. When ingested, the fruit is reportedly “pleasantly sweet” at first, with a subsequent “strange peppery feeling . . . gradually progressing to a burning, tearing sensation and tightness of the throat.” Symptoms continue to worsen until the patient can “barely swallow solid food” because of the excruciating pain and the feeling of a huge obstructing pharyngeal lump. Persons who may have ingested a machineel fruit, who may have either oropharyngeal burns or gastrointestinal symptoms, should be evaluated by medical professionals or admitted to a hospital for appropriate treatment. It is also reported that machineel is toxic for many birds and animals, but the black-spined iguana (Ctenosaura similis) is known to eat the fruit and even live among the limbs of the tree. Land crabs and some species of birds love this tree and can even eat the fruit with gusto. 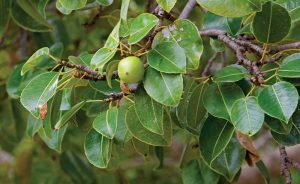 Considering all the ways it can hurt you, it’s no wonder the manchineel currently holds the Guinness record for “World’s Most Dangerous Tree.” With the poisonous nature of this tree, it is best to stay at least a few yards away from the canopy. In some parts of its range, many trees carry a warning sign, while others are marked with a red “X” on the trunk to indicate danger. In other countries and territories, the trees are identified with a painted red band a few feet above the ground. In the Turks & Caicos Islands, however, trees are usually unmarked. Conquistador Juan Ponce de Leon is probably the most famous victim of manchineel. In 1513, Ponce de Leon led the first European expedition into Florida, and he returned to colonize the peninsula eight years later. De Leon’s invasion met resistance from Calusa fighters. These native Caribbean people used manchineel sap to make poison arrows, and one of these sap-tipped arrows reportedly struck Ponce de Leon’s thigh during the 1521 battle. He fled with his troops to Cuba, where he died of his wounds. While the tree is considered to be the most dangerous tree in the world, Caribbean carpenters have used it for centuries as a source of timber for furniture. They carefully cut the trees and dry the logs under the sun to neutralize its poisonous sap before working on them. A gum produced from the bark reportedly treats edema, while the dried fruit has been used as a diuretic. Extracts of the seeds and bark have been used as a vermifuge, as a cathartic, and to treat venereal diseases and tetanus, although in these cases, the cure may be worse than the disease. Despite the attractive and salt-tolerant nature of this tree, it is not recommended for use in landscaping or for ornamental purposes, due to its poisonous nature. In spite of its toxicity, manchineel provides ecological value, just like other trees. Aside from its aesthetic qualities, derived from green lush leaves, it serves as a natural windbreak. Its root system prevents soil/beach erosion, an important ecosystem service in light of the growing threat of sea level rise from climate change. The high toxicity or biotoxins which can be derived from the tree may inspire scientists and researchers for bioprospecting (the process of discovery and commercialization of new products based on biological resources). The danger attributed to the toxicity of the manchineel tree potentially outweighs its ecological values, especially in areas frequently used by humans. The seeds germinate easily, and it may be prudent to destroy seedlings in human-frequented areas in order to avoid the spread of this poisonous plant. In natural areas, removed from human activity, total eradication of this species is not recommended. In spite of its toxicity, manchineel, like all organisms, serves a function in the conservation of biological diversity. In the future, it may be found to provide valuable raw materials for scientific advancement, yet to be discovered.